The New Mexico House Rabbit Society, the local chapter of an international rabbit rescue organization, is pleased to announce our next event! The event is a book reading for children that will be held at Bookworks bookstore, 4022 Rio Grande Blvd NW -6 September 2014 at 10:30 a.m. The New Mexico House Rabbit Society, in collaboration with Bookworks bookstore, will hold a fun and family friendly “Meet the Bunnies!” presentation at Bookworks. The presentation is part of Bookworks’ BOA – Big On Animals program. The BOA’s purpose is to let children know that there is something they can do to help take care of animals. As September is International Rabbit Month this is your child’s perfect opportunity to learn about rabbits, to find out what terrific pets they are, and, best of all, meet some rescued bunnies! “The Forgotten Rabbit” by Nancy Fursinger is the featured children’s book for this event and is in stock at Bookworks. 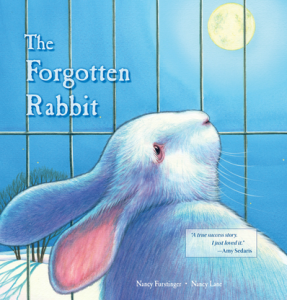 “The Forgotten Rabbit” is a picture book about a bunny that is given as a gift but is left alone after a while. A young girl adopts the rabbit and its life turns around. The lively presentation will help bring the book to life and will introduce families to some very real, very loveable, rescued rabbits. For event information contact Connie Griffin – Children’s Book Specialist – at Bookworks at kids@bkwrks.com or 505 344 8139. Help us celebrate International Rabbit Day!